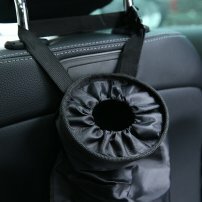 Auto Trash Bag / Vehicle Garbage Bag / Back Seat Hanging Rubbish Bag / Leakproof w/ Adjustable Strap [CAR005972] : Onchee.com - the accessory shop for all your handheld Electronics! Made of high quality Oxford with construction and attractive design makes your car never so Tidy. Litter Trap to help turn car clutter into convenience.This trash bag was created using durable materials and can last as long as you would like it to.Stop wasting money on disposable plastic bags and be a friends to our environment. - Durable Material - Adopted high quality oxford cloth to ensure long time use. This car trash bag is washable and easy to dry, keeping your vehicle clean and tidy. - Convenient to Use - The trash bag is a must have for drivers & travelers alike. The trash bins are designed in a most practical way. The trash bins takes up minimal amount of space yet gives you full garbage capacity, without taking up all your legroom.Easy to clean rubbish bag with elastic top closure and strap for hanging on the backside on front seats. - Environment Friendly - Helping the enviroment everyday. With this trash bag you not using any type of plastic bag. Saving you money and also keeping this world clean. - Versatility - It is not only a car trash bag but can also used as a storage bag for toys, clothes or whatever else you want to put inside. - Good Design - Bottom with Velcro design, more convenient to dump trash out. - Net Weight: 33g approx.